This simulation selects random x-values between 0 and 1 and random y-values between 0 and 1 to create a point within the unit square. What proportion of these points land within 1 unit of (0,0)? 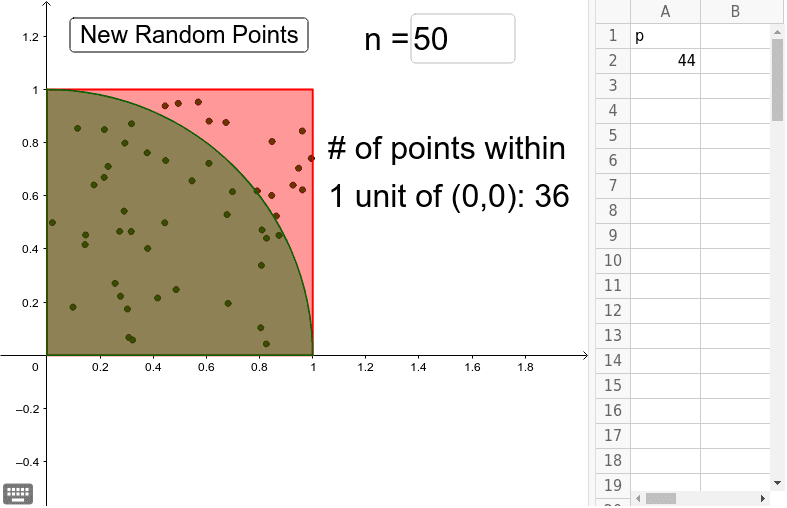 Get a new set of random points at least 10 times, using n = 50 for each. Save the number of points landing within the unit circle (p) for later. Now run at least 10 trials with n = 100. Again, save the numbers for later. Using your 10 simulations of size 50 as one large sample of size 500, construct a 95% confidence interval for the proportion of points that can be found inside the bounded region. Using your 10 simulations of size 100 as one large sample of size 1000, construct a 95% confidence interval for the proportion of points that can be found inside the bounded region. Multiply the bounds of each confidence interval by 4. What have we just estimated? Why?